I love the comments that I received from my first posting about our full moon fire ceremony that took place this past July. Since then I have had the opportunity to do several sessions on those who were present for that electric experience. It is amazing to me even after all these years how powerful and transformative the drum is. Toby rips it up on a full moon! 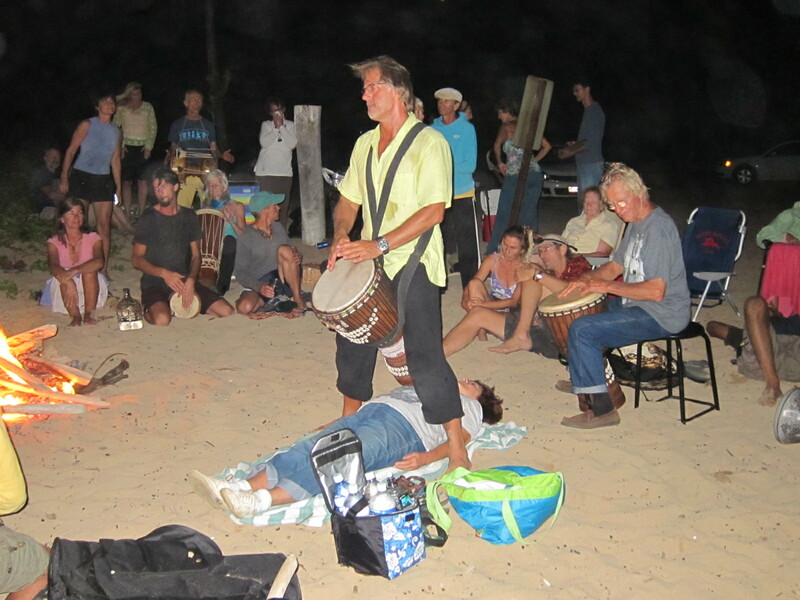 There were several people that night that laid under the drum for a few moments of healing. And as each of them came forth, it was clear that the intention of the full moon was to heal the family—or ohana as we say in Hawaii. The other drummers that were present did a great job in holding a container for the people who needed healing. If you look to the right side of the picture there’s a gentleman with a pair of jeans on a grayish blue shirt. This is Chris Hayden. He is the anchor here on the island for 5 element drumming. Chris took an interest in this work after seeing me at an expo here on Kauai a few years ago. Since then, every Friday night he and many of his friends gather to practice the 5 element rhythms. It is my intention this year to have them as my backup band for my appearance at the expo. Toby drumming with sound healers Tibo, Lisa, and Debbie. 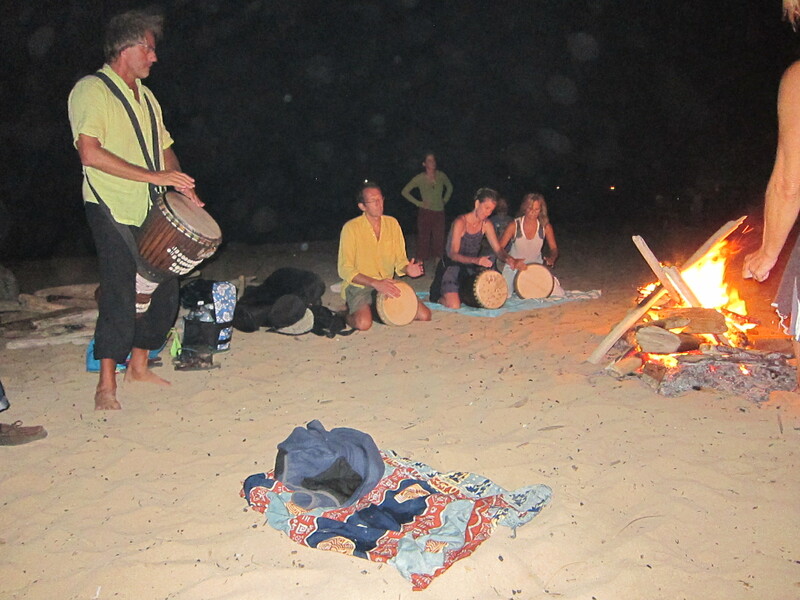 One of the awesome aspects of this particular night is that in front of the fire with their drums resting on the blankets were 3 attendees of my sound healing workshop. Immediately to my left, in the gold colored shirt, is a wonderful man from France named Tibo. It was a pleasant surprise when I found out the amazing synchronicity that he and I shared. He is involved in a long-term study with my dear friend and brother Malidoma Somé. This event is hosted by a couple of my friends that I met at the 4 Winds Society. His wife is attending a graduate school that I worked with many years ago. And Tibo, in addition to being a very proficient drummer, is also a great didgeridoo and flute player. In fact, his teacher is good friends with my friend John Dumas. It is a very small world! In the middle of the three, wearing the purple top, is Lisa from Cincinnati. She came into profound power during the workshop that allowed her to step aggressively and confidently into the drumming we did the evening of the full moon ceremony. I met her some time ago during one of my journeys to Cincinnati, and look forward to seeing her again as I visit there more often. On the far right, with a bunch of orbs coming out of her head, is Debbie. She is from the Chicago area, and with her husband, Marty, owns one of the premier labyrinth building companies in the world. Debbie is already an experienced healer with other disciplines, but after our time together in Tucson, Arizona for the Earth Walk event, she decided to take the sound healing course. The sound healers putting their skills to work. I was not sure how things would go at the full moon ceremony when almost everyone who showed up had a drum or an instrument of some sort. Although people come with good intentions, sometimes it can be challenging over the wind and the fire to hear each other and stay connected. That was certainly not the case that night. Once the rhythm started, the students got their groove on and the whole group unified and created an amazing place for healing transformation. It was also interesting to watch the way the fire held the energy of the group. When the rhythm would increase in intensity, the fire would rage, pop, and expand. As the energy would cool down, the fire would be more subdued. It was an evening of connecting to the community, connecting to the planet, and experiencing the dance between the sound of the drum and the rhythms of nature. Everybody did a great job. I’m very proud of you all! And thanks to the ohana for welcoming us mainlanders by helping us feel so welcome and included in your community.